Adam's Blog: Using a Raspberry Pi as a remote Seneye monitor. Using a Raspberry Pi as a remote Seneye monitor. 1) Keep the device plugged into a computer at all times. I had a spare laptop laying around but didn't really like the idea of having it sitting under my aquarium. I also didn't fancy paying the extra to buy the Seneye webserver. I did a little research and came up with a solution. The USB hub I used has no external power. Luckily the Seneye and Wireless USB dongle use a relatively small amount of power. For anything more intensive you would need a powered USB hub because of limitations in the Raspberry Pi. I clicked the Seneye device and it appeared in the Seneye Connect application. I'm really pleased with how this turned out. VirtualHere works as expected and I haven't run into any problems yet. I have a media center running all the time which was perfect for housing the VirtualHere client software. What happens though when it is turned off. Does it go back to offline mode. Hey, this is just what I was looking to do with my Seneye as the USB webserver they sell is >£100 would you believe? Great blog. I'm going to try this out with my own aquarium and Pi. Thanks for sharing. It's working! A few minor issues with the instructions which I will outline below, but thanks for posting. Thanks! This weekend I will receive my Seneye and I've already setup my Pi with your instructions. What happens if the Pi reboots? Will it automatically startup the virtualhere service? Or do I have to do something extra for that? I'm currently running it on Raspbian. When the pi reboots it automatically starts virtualhere again. Question: does someone know if we could use the rpi as a webserver to automatically upload the data from the Seneye to the Seneye website so I can check it with my iphone? i followed this and works for me. now virtualhere autorun when rpi reboots. This is genius. YOU are a genius! You just saved me $150-200 bucks. /etc/rc.local is the place to put 'vhusbdarm -b' btw. It'll start on every reboot if it's there. Using your blog as inspiration, I've got my Seneye Reef and Raspberry Pi set up as per above and want to say thank you for saving me a fortune. At first the Seneye wouldn't talk to my PC, and I had to contact Seneye support. I mentioned the Pi and they said they were aware that quite a few people were using them. In the end their developers had to get involved and use Team Viewer to faff about with my PC drivers to get it to phone home in order to install itself. The Raspberry Pi end of things works absolutely fine. 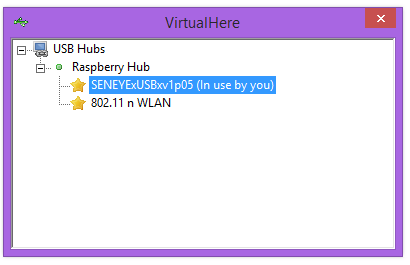 I'm not using a hub, just the Pi plugged into the mains and the Seneye connected to it. My programming isn't up to writing an autostart script though, so if the Pi ever loses power I'll have to restart VirtualHere manually. Have you tried this setup running the Beta for V2? this worked great, thanks for the post!. now we just have to get them to make a linux version of seneye connect so we can completely skip this whole usb to server nonsense and just run it strait from the Pi. I am about to buy one also. could I collect the parameters, like as on a normal sensor? 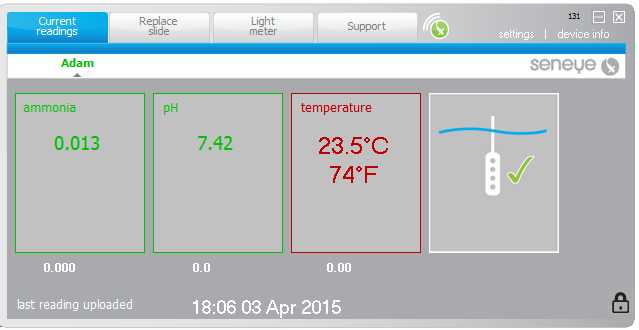 I have already a Pi controlled aquarium, and to implement this parameters would be great. FYI I was able to update to Seneye Connect App v2.1.20.0 on Win10 64-bit, and process the firmware upgrade of the Seneye SUD to 2.0.16 while using this configuation. -Device finished its firmware updating and now shows as "Seneye SUD v 2.0.16" and after choosing auto-use port/device one final time Seneye Connect App loaded up with all its details. Have you had issues with connecting since the latest updates? I've been unable to get my device to be seen since the latest updates to the device.